Bok Bok & L-Vis1990's NIGHT SLUGS, London's hub for futuristic club music, has gone from strength to strength in the last two years. 2010 sees the launch of the Night Slugs record label, bringing through a crew of supremely talented new protagonists. 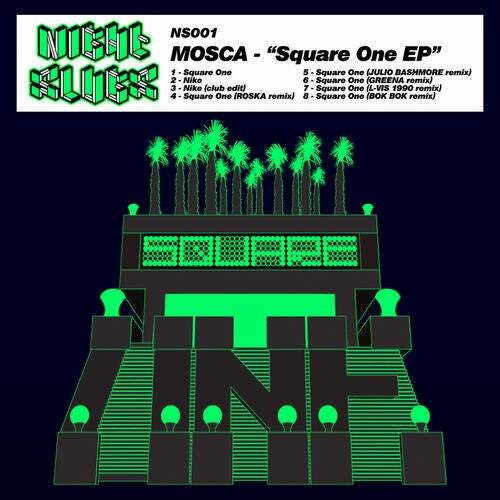 The label's first release is the 'Square One EP' from London producer MOSCA. The title track is already a potent anthem on the LDN underground, an iconic cross-section of garage-dubstep-funky. With it's epic crunked-out synth-line, broken drums and rolling bassline, 'Square One' sums up a year of genre-bending experimentation in one fell swoop. MOSCA's incredible b-side 'Nike' is a 10-minute long dedication to that original rudeboy choice, the Airmax. Starting off with a gorgeous broken hiphop segment, 'Nike' sveltly builds in tempo, sneaking the listener into a 135 bpm dubbed-out Basic Channel-with-autotune banger. The digi EP also comes with a 7-minute edit of 'Nike' at a fixed tempo, for those less extravagant, more up-front club situations. The package is completed by 'Square One' remixes from a Who's Who of UK club music. UK house & funky hero ROSKA applies his gutter house touch, with a pitched 808 bassline designed for droppin' down low. Bristol's rising star JULIO BASHMORE goes big-room with his Longhorn remix, all carnival brass and booming toms. GREENA's mix is a sidechained beast, as sonically inventive as it is dancefloor destroying. Meanwhile Night Slugs label bosses BOK BOK & L-VIS contribute a mix each, respectively crunked up and blissed out. An 8-track deep statement of intent, the 'Square One EP' signals the start of a new era for London club music.